Here on my blog, I use the Standard Theme, a premium WordPress theme that rocks. Back in October I had the privilege of having a burger with John Saddington, of Tentblogger.com before I rebooted my blog, and before my wife and I made the decision to pursue adoption. Both of which he was a huge inspiration. John, along with the 8Bit team are genuine and they all have a servants heart, and love to help people. They just absolutely rock. Ok back to Standard. They just announced a special 20% discount on all Standard Theme products, starting now and lasting until Wednesday the 15th. The theme looks great out of the box, and makes it easy to get started with advertising and social media. As I shared in my January Month in Review, moving from a frustrating b2Evolution software to the awesome wordpress.org, then adding Standard Theme on top of it just rocks, this theme seriously just works. Standard comes with the popular “Follower Counter” feature, which integrates your RSS and Twitter followers. It uses SEO best practices and chances are you’ll notice an increase in search traffic almost immediately. The Support License , which usually costs a one-time fee of $99, is on sale for about $79 and comes with technical support for life! In addition to that you get access to a growing community of developers and designers, as well as new styles (called customizations) every month. Even better, once you purchase the Support License, all future version upgrades to Standard Theme are included! It really is a great deal. 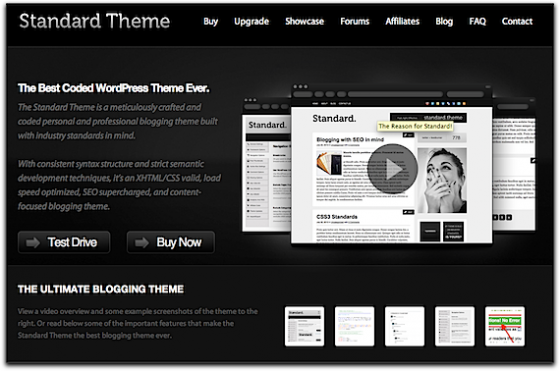 Mashable called Standard one of the 8 best premium themes available for WordPress in 2010. Any blogger who wants to increase their traffic, begin selling advertisements, or improve the speed of their blog should seriously consider making the jump to Standard. I’m glad I did! It’s pretty rad. I’m glad I switched to it as well. A definite must for any serious blogger. Serious blogger? I like it. Ben, I would love to be able to go legit, and break free from having that pesky “.wordpress” attachment on my blog, but I am sorely lacking in any kind of tech-savvy or Internet-proficient knowledge. I email. I blog. I use Google. Color me done. If I pursued this WordPress Standard theme, would I be able to modify it, and make it mine? Do I need to be super-tech-geek, or can I be silly and ignorant and still come up with a solid look? I know several of you guys that I follow use Standard Theme. Is it really worth the investment? I am also not a Twitter/Facebook, or any kind of social-media fella. Since this is so, would it be that this WordPress theme would be overkill for me? Kinda like too many cool options that I would probably not exploit or use to their fullest. Should I just stick with staying on as a WordPress slave, (sans FB/Twitter usage), or should I jump into this Standard Theme? Would Standard work as just a plain and simple blog for me? Yes you would be able to modify it and make it yours. No you don’t need to be SUPER tech-geek, and with sites like tentblogger.com and it’s community, you’re basically gold. These guys are super helpful. If you’re going to make the move to a self-hosted blog, Standard Theme actually makes it easier to configure your look, as simple or complicated as you want. Hey, guess who’s gonna be asking for Standard Theme for his birth-anniversary present? Yep. That’s right. Me, baby! My bride has been asking me what I would really like this year, even though my official b-day isn’t until September. Since it is impossible for me to get a copy of Giant-Size X-Men #1, I reckon I will have to content myself with Standard Theme. When this all happens, I will be looking into the tentblogging thing you mentioned. Thanks, Ben, for answering my quest-ee-yon-z. Ha! Giant size x-men would be so boss. Read up on all the posts in there so that by the time you actually do make the move, you will have all the information you need to do it right. I am ready to make the leap into legitimacy, and I have some questions. I am currently on WordPress, for free, and I understand that I need to “self-host” to get The Standard Theme. Okay. SO this means I need to do what, exactly? Do I need then to get a real blog address, sans the whole ‘wordpress.com’ attachment and have it hosted somewhere? I am assuming this will cost money. Can I use any provider or is there one that is better and more reliable? I’m not an expert, but I have heard poor reviews of GoDaddy. Any assistance you could provide, or anyone who is reading this!, would be appreciated, since, honestly, it is your blog post here that has pushed me off the fence about going mainstream and getting a legit blog. If it is easier, please email me: projectmathetes@ymail.com. hit Peter Pollock up at Newbloghosting.com to help you our. He helps idiots like me. I’ve had it for a couple months, and am very pleased. Not at all. Is it bad that I bought it for myself as an early Christmas present? You should be able to by just putting in the heartstandardtheme code, something weird’s going on with the upgrade link though, I’ll investigate. In case you didn’t see the response in the other post, upgrading with the discount is now possible. After clicking on Buy Now, just scroll below the first Add to Cart and click where it says “Need an Upgrade?” Then you can put in your code: heartstandardtheme and then update the cart before going to paypal. Best money that I have spent on my blog! Guess who just bought StandardTheme? Hug, fistbump, hug, fistbump? What about a slap on the behind like in football? WWJD? What would He really do? Just a random thought based on your conversation. Actually I think he would do the worm, or maybe not. Or some Hammer-style dance moves. Jesus is, after all, 2 legit 2 quit. Michelle, don’t worry about it and thanks for asking. Here’s how it works, when you purchase the theme you’re purchasing the license to use the theme and they give you a link to actually download the files to upload to your server. With the Support license you get upgrades for life, as well as access to support forums which have proven to be invaluable throughout the course of troubleshooting/customizing. When you actually add to the cart, you put in the code “heartstandardtheme” and it shows you the 20% off in the cart before you purchase. Thanks for the reply. So basically when you pay for the license, you get the download. I think i get it. I’m really getting tired of looking for themes and I like that you can change this one around whenever and the support too. Plus you guys all have it. So I can bug ya. ha ha just kidding. So its really $79 not $99 right? As long as I order before next Wed? I really want to do it. I just gotta convince the hubs that its not a waste. I do some writing on the side though that I get paid for. Maybe I’ll use that to fund my new theme. Yup, and you can see the discount before paying by just hitting Update Cart after putting in the code. The support is phenomenal and the community behind ST is rad.